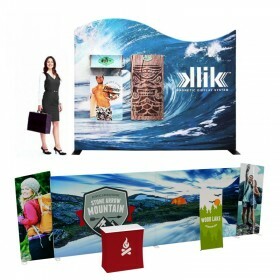 Trade show accessories including portable counters and podiums, display lighting, shipping cases, custom table covers, life size cutouts, literature racks, trade show tables and more. 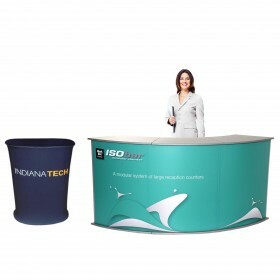 Portable trade show podiums, counters and kiosks are perfect for your next trade show, marketing, conference, or convention event. 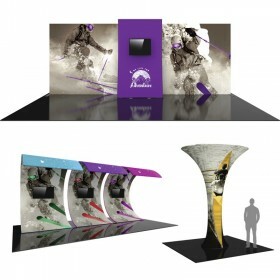 Browse our innovative trade show display kiosks and podium solutions. 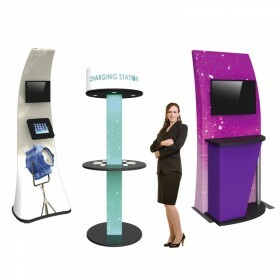 Interactive charging station displays and options available for iPad, Samsung, Monitors or TVs, with or without custom printing. Shop online. 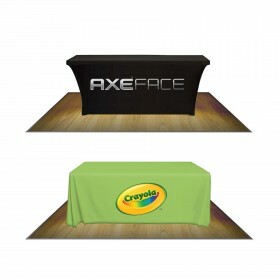 With printing or without, our 6ft premium trade show table covers increase visibility at your next event. 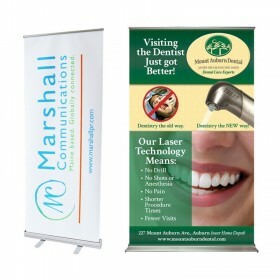 Our quick turnaround, no minimums or set-up fees. 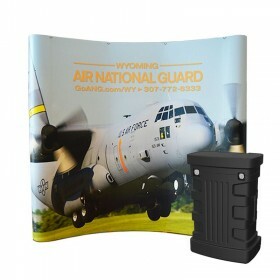 Order your fabric throw cover today! 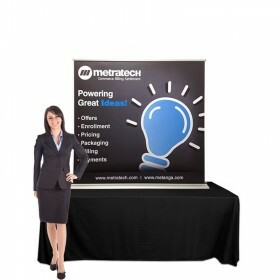 With printing or without, our 8ft premium trade show table covers increase visibility at your next event. 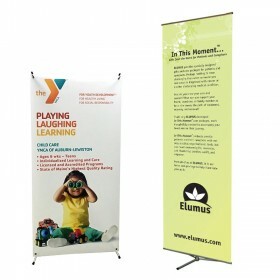 Our quick turnaround, no minimums or set-up fees. 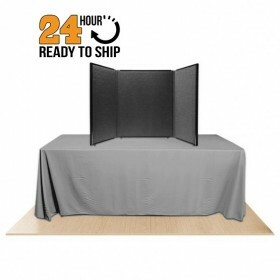 Order your fabric throw cover today! 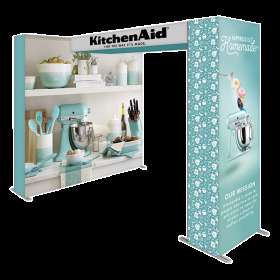 Help promote brand awareness of products and services a company has to offer with our literature stand. Featuring a variety of literature rack styles, all in stock and ready to ship. Choose your style today! 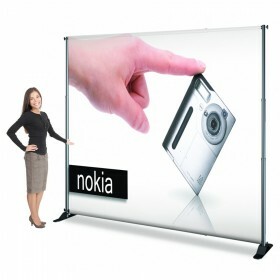 All weather outdoor banner signage perfect for sidewalks, trade shows, promotional events, hallways, shopping malls, and retail curbs. 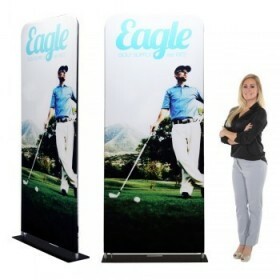 Versatile and portable they can be moved anywhere to meet your target audience. 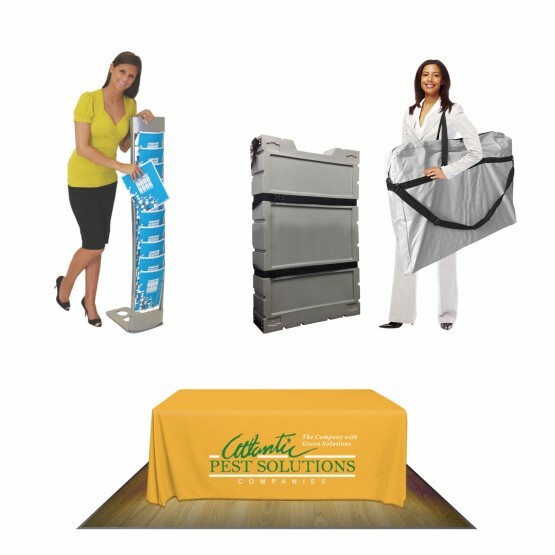 Our wide selection of trade show exhibit shipping and carry cases are perfect for the traveling salesman. 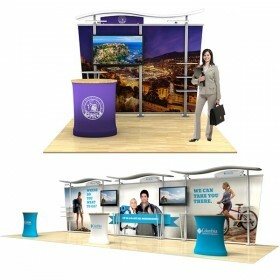 Shipping cases, flat cases, carry bags, round cases for many style trade show displays are available. 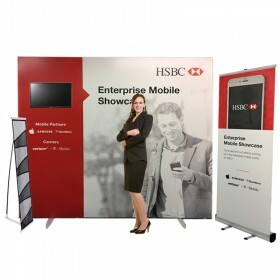 Have fun and bring attention to your trade show booth space with our promotional life size cutouts, photo standees, and lifesize standups. 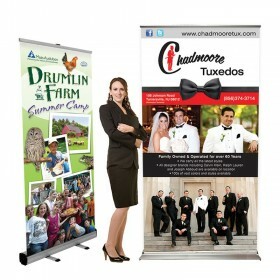 For award contest winners, donations or award recipients our jumbo checks are a great way to show off your business. 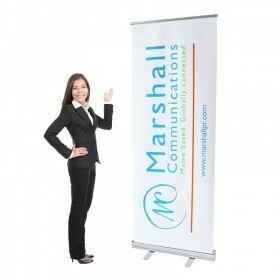 Custom logo printing, one time use or dry erase feature available. Order today! 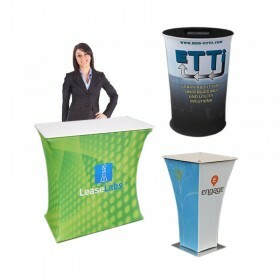 Many styles of Folding Tables and Directors Chairs available to compliment any booth space. 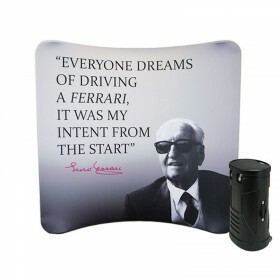 Most standard items are in stock and available for quick shipping. 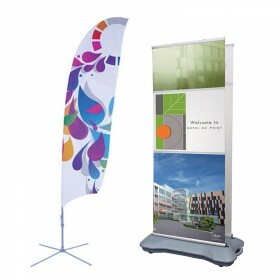 Optional custom logo imprinting options will add pizzazz and make you stand out in the crowd. 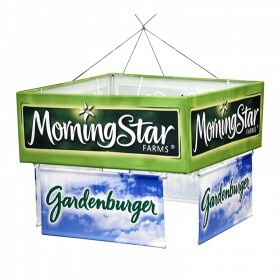 Browse our large variety of trade show display lighting fixtures to brighten your banner display, accent your products & help draw visitors to your booth. 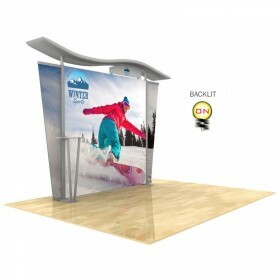 Spotlights, LED lights & backlit options are versatile to fit any brand exhibit display. 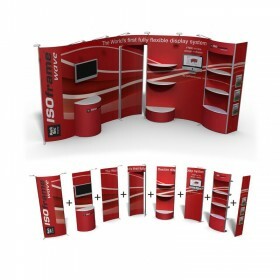 Trade shows are a great avenue to increase sales so why not add to your trade show display with one of the many accessories available. 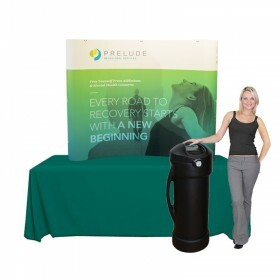 Portable trade show counters & podiums provide a usable space for taking attendee information, as a giveaway station or just to improve flow in your trade show booth. 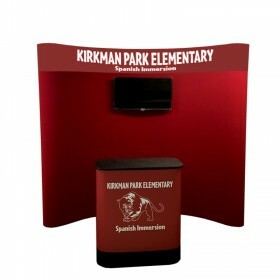 View all of the details for our available trade show interactive kiosk and monitor stands on our website and use our convenient online shopping cart to place your order now. 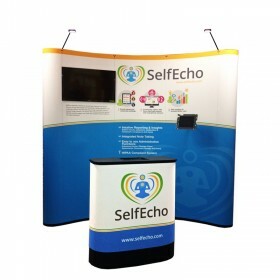 Add these optional items for any trade show booth to stand out in the crowd at your next show or promotional conference. 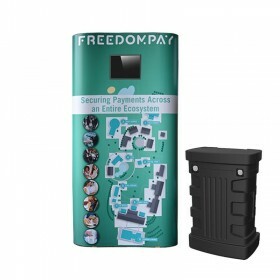 Most items are in stock or ship quick to meet your upcoming deadline. Shop now for all available options. 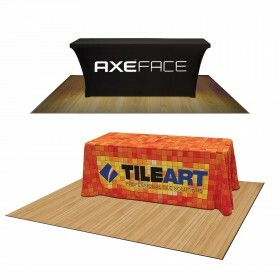 Here at Affordable Exhibit Displays, we provide many options for custom table covers to showcase your logo or for brand identity. 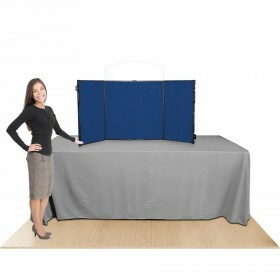 These options include table throws, table runners, convertible table covers or custom table covers with imprinting. 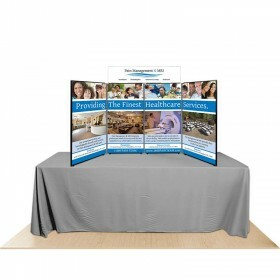 We also understand that not every event needs a logo tablecloth, so feel free to browse 6ft or 8ft options available in multiple fabric color choices. Styles include a full table throw that drapes over all 4 sides of the table to the floor, an open back table throw that drapes over the front and 2-sides of the table or the fitted option for a more tailored look. And with our quick production times there's no need to worry that your order won't be delivered on time, every time. 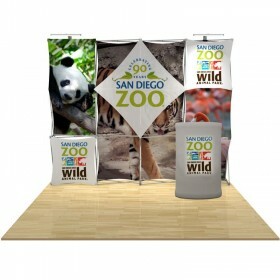 Our selection of portable trade show literature racks are chosen with portability and style in mind. 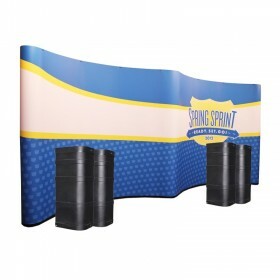 Each brochure rack has been tested to ensure the highest of quality and that the construction will endure even the most busy of trade show schedules. 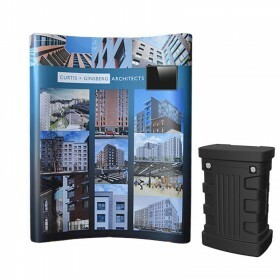 You won't need any tools for assembly and most just unfold open and are secured with a latch for you to conveniently place your printed brochures within easy reach. 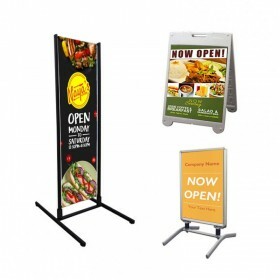 If it's outdoor signs you're looking for, there are many options to suit almost any budget and advertising use. 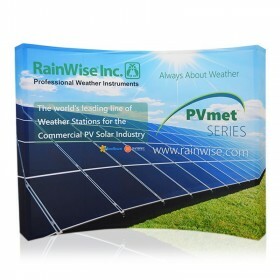 Styles include A-frame sidewalk signs, double sided banner stands and message signs, all constructed with durable plastic or sturdy aluminum to endure the elements - rain or shine. 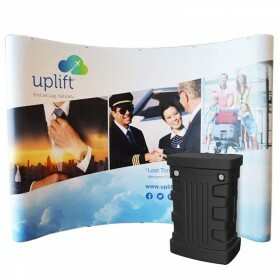 And for those trade shows that might not be local, our product line includes travel trade show cases like carrying bags and shipping cases to help make transportation as easy as possible. The perfect way to announce your generosity and get your donation noticed is with an oversized check. 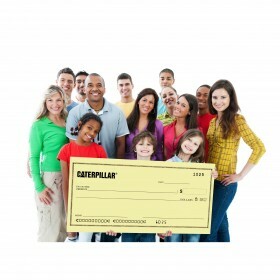 A large donation check is great for presentation photos, but also a great advertising tool for a charity fundraising event, fund raising event, award banquets, political campaigns, grand openings, corporate awards, contest winners, lottery winners and more. Insure you get all the attention in local papers, on the internet and in any press releases with an oversized check. 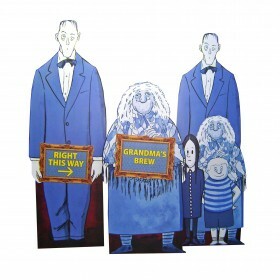 Bring any image to life with our popular custom life size cutouts. 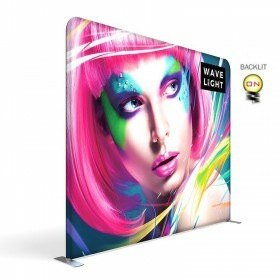 Send us your high resolution image, photo, product or group photo and our vivid high resolution printing will make it come to life. 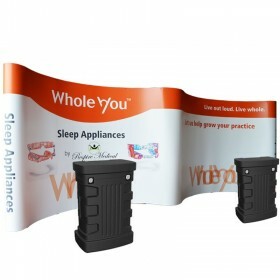 We produce our durable life size cutouts with corrugated plastic due to its rigid properties - your life size cutouts will hold up 10x better than corrugated cardboard and is suitable for long term use. While you're here be sure to check out our new classy wooden chairs! Featuring weather proof beech wood frames, choose from either unprinted fabric backrest and/or seat or a FULL COLOR custom printed backrest and/or seat. 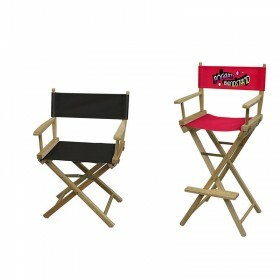 Our wooden director chair is available in Bar Height or Table Height. 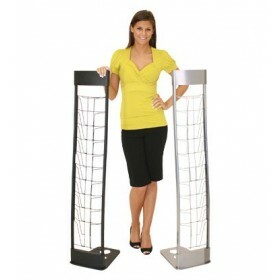 Uses are endless with indoor or outdoor venue events or on patios. 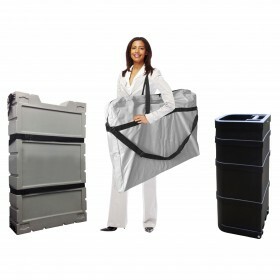 They are lightweight and collapsible for storage and transport. 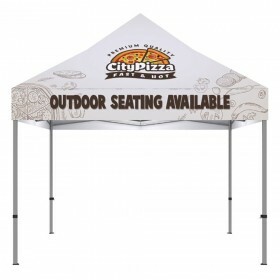 When combined with any of our other outdoor signs or advertising flags and ez up tents, you'll create a covered seating area for an even greater impact. When exhibiting at an outdoor trade show, it’s all about the cool factor so add LED light fixtures to your trade show booth space to highlight new products or attract attendees. 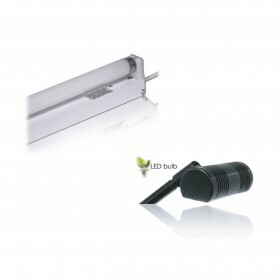 LED lighting is a small investment that makes quite the impact. And there's no need to worry about overheating - LED lights emit very little heat in comparison to incandescent bulbs which release 90% of their energy as heat. Our friendly sales staff is available to take your questions - call 1-800-723-2050 or email us today! 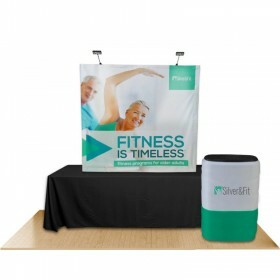 We make the order process quick and easy - so go ahead and just sit back, we'll make your trade show display purchase so easy you'll want to come back again and again.